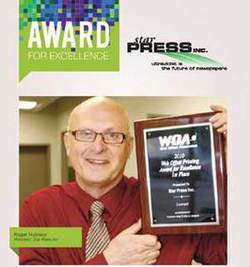 At their annual May conference in Baltimore honored Star Press of Wainwright, (our press) with a first place award of excellence for web offset printing using UV inks on Newsprint for North America. Star Press president Roger Holmes, the Pipestone’s print master and friend, accepted the award and was one of the speakers at the conference on the topic of using ultra violet light to cure inks in the printing of newspapers. Way to go Roger! As a 100% locally owned and operated business, we applaud your achievements, are proud to be your customer AND honour the commitment to be state of the art. Innovation at our back door by our neighbours. Why not?